In this article we speak to Graham of Allfloors Contract Flooring Glasgow to make sure you know what you need to know when it comes to commercial flooring. Often last to be considered, flooring really brings your business to life. It is often seen as the final stage in any renovation or new build project. Flooring contractors enjoy being the last people in as they are always seen as the guys who finish the job completely! There are several options to go for when choosing office flooring so make sure you read this guide to get yourself clued up. Are you in an office right now? If you are chances are it has carpet tiles. Ever wondered why the carpet comes in square blocks? Once we tell you it will be obvious! Carpet tiles are designed as tiles so that if one section of the carpet is damaged, you can replace that single tile, rather than the whole carpet. Genius right? This makes them easy to maintain. Durability is also not as important a factor here as the tiles can be changed if the carpet is worn down. This makes the cost of the carpet go down as it is more of a long term investment when compared to traditional carpet rolls. The only downside to carpet tiles is that they are not always as appealing as fancier options such as luxury vinyl or tiles. However, they get the job done in a cost effective and practical manner. 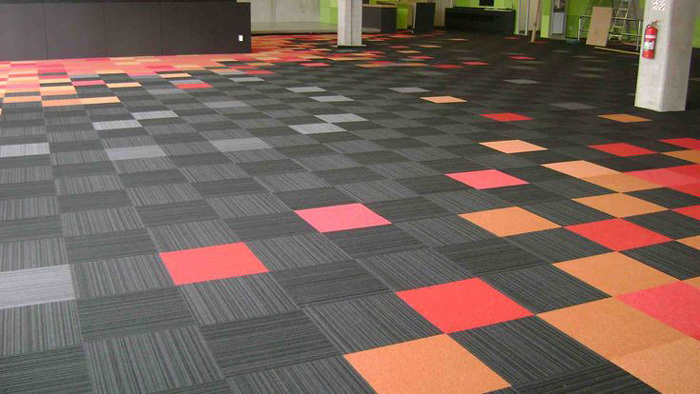 Check our Forbo Flooring, the leaders in carpet tiles. If you are running a restaurant this is a must for kitchens. Safety flooring keeps your workers safe and helps prevent trips and slips. When staff safety comes into play aesthetics aren’t as important. Also, customers don’t tend to see the kitchen area in a restaurant. Rubber flooring is also essential for bars or anywhere where liquid might be spilled. You don’t want bartenders aggressively mixing cocktails over your fancy carpet do you? This kind of flooring is also quite important for toilets from a hygienic point of view. Luxury vinyl can still be used in toilets but rubber flooring adds that extra safety feature for visitors using your lavatory. A little more expensive, luxury vinyl flooring adds that wow to your commercial property. Perfect for buildings that want to impress potential tenant’s and their clients luxury vinyl flooring is extremely durable, easy to clean and look absolutely stunning. There is however no real safety features and prices can be non-competitive compared to other options. For luxury vinyl, Amtico and Karndean are the industry leaders by a mile with Amtico being slightly more high end that Karndean but with Karndean being more affordable and, by some reports, more durable. This is down to you. If you need safety flooring then you will need to investigate safety flooring. If you are price driven, go for carpet tiles. If you are looking to impress, go for luxury vinyl. Some commercial buildings also use laminate, hardwood and traditional carpets which could also be suitable. Flooring contractors come in all shapes and forms, from large commercial entities to individual freelancers looking to do a few homers for extra pocket money. Choosing a flooring contractor simply comes down to budget and trust. One key thing to look out for however is warranties on products. Check with the manufacturer, but some products come with warranties that are only valid if installed by a flooring contractor that is registered and approved by the manufacturer.